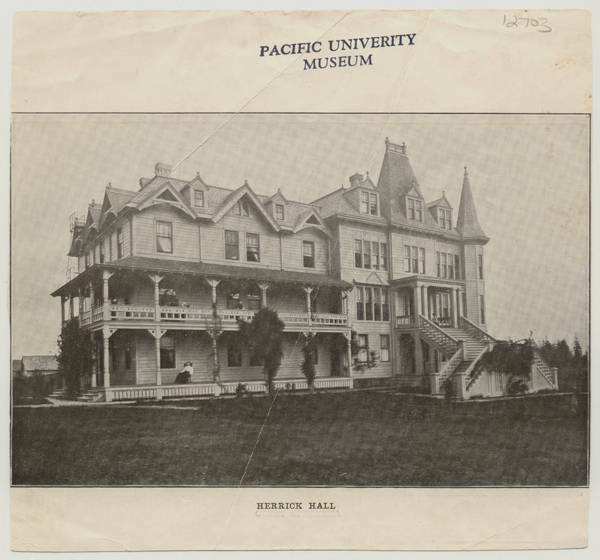 Photograph of Pacific University's Herrick Hall with students on the porch and balcony. It was built around 1882 as the women's dormitory and burned down in 1906. It was named after Reverend John R. Herrick, Pacific's 1879-1883 president. The photograph was apparently taken from a yearbook or a museum magazine. On the opposite side is a picture of the Pacific athletic field.